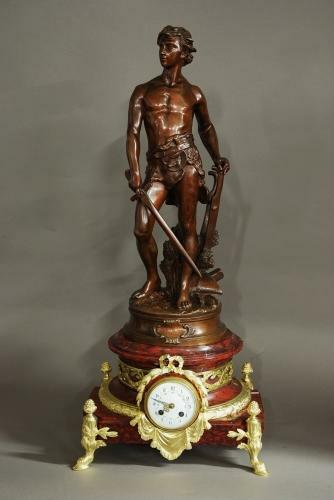 This clock consists of a finely cast brown patinated French bronze of 'Le Devoir' (The Duty to protect the Homeland) by Adrien-Etienne Gaudez (1845-1902), the figure is that of a young man dressed in an animal skin and holding a sword as protector, standing next to a scythe, a plough and sheaves of corn. The bronze figure is supported by an impressive red marble (possibly Rosso brecciato) and ormolu base with a central clock to the front with an enamel face (slight wear to the enamel). The ormolu decoration surrounding the clock consists of ribbon, husk and swag designs and the four decorative feet consist of acorns, foliage and hoof feet. This clock was in working order when purchased but due to travelling in transit it will need to be set up by a clock maker or a horologist once purchased. This is a versatile piece as it can be displayed with the figure supported on the marble base or equally the figure displayed without the base. This bronze is in very good condition.